Also serving communities of Valley Glen. There are 161 Assisted Living Facilities in the Van Nuys area, with 7 in Van Nuys and 154 nearby. The average cost of assisted living in Van Nuys is $2,216 per month. This is lower than the national median of $3,346. To help you with your search, browse the 441 reviews below for assisted living facilities in Van Nuys. On average, consumers rate assisted living in Van Nuys 3.4 out of 5 stars. Better rated regions include Panorama City with an average rating of 4.0 out of 5 stars. Caring.com has helped thousands of families find high-quality senior care. To speak with one of our Family Advisors about assisted living options and costs in Van Nuys, call (855) 863-8283. Van Nuys, a neighborhood in Los Angeles, was born in 1911, in what was then an undeveloped desert in San Fernando Valley, as part of a mass auction of land parcels. Today, the neighborhood's mild weather, outstanding medical facilities and beautiful streets dotted with palm trees make it an attractive place to retire. Seniors looking for assisted living in the area have plenty of options, with over 160 assisted living facilities, called Residential Care Facilities for the Elderly (RCFEs), available in and near Van Nuys. Assisted living communities may give their residents the opportunity to explore Van Nuys and other areas in the San Fernando Valley with group trips. Local points of interest include the Van Nuys Recreation Center, Delano Park and the Van Nuys Branch Library. Seniors who are history enthusiasts can also check out exhibits at The Museum of San Fernando Valley and The Nethercutt Collection. Van Nuys boasts some of the most picture-perfect weather in the country. The neighborhood is located in the San Fernando Valley, where seniors can bask in 329 days of sunshine in a typical year and enjoy an average daily temperature of 77.5 degrees Fahrenheit. The Van Nuys area is home to world-class medical facilities, including Valley Presbyterian Hospital, in the event of medical emergencies or illness. Public transportation in Van Nuys can help seniors move around the neighborhood and outlying regions easily. The area is served by the Los Angeles County Metropolitan Transportation Authority, Metrolink, Amtrak and the Van Nuys Airport. Van Nuys is in Los Angeles County, which has some of the dirtiest air in the country. Pollutant levels here are high enough that they may put seniors' health at risk. State income taxes may take a bite out of the budgets of seniors living in Van Nuys. Social Security benefits are tax-free, but other kinds of retirement income are taxable. Assisted Living costs in Van Nuys start around $2,216 per month on average, while the nationwide average cost of assisted living is $4,000 per month, according to the latest figures from Genworth’s Cost of Care Survey. It’s important to note that assisted living rates in Van Nuys and the surrounding suburbs can vary widely based on factors such as location, the level of care needed, apartment size and the types of amenities offered at each community. Two programs are available to help qualifying seniors with expenses at assisted living facilities in Van Nuys. 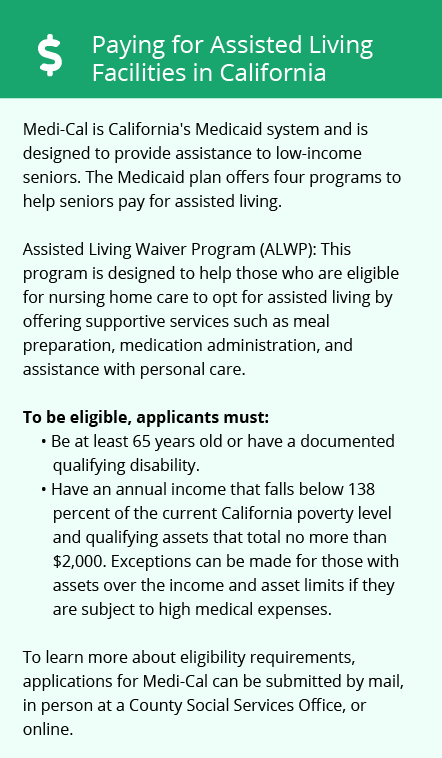 The first, California’s Assisted Living Waiver Program, is for seniors who are eligible for Medi-Cal, and helps pay for assisted living services in Los Angeles County. 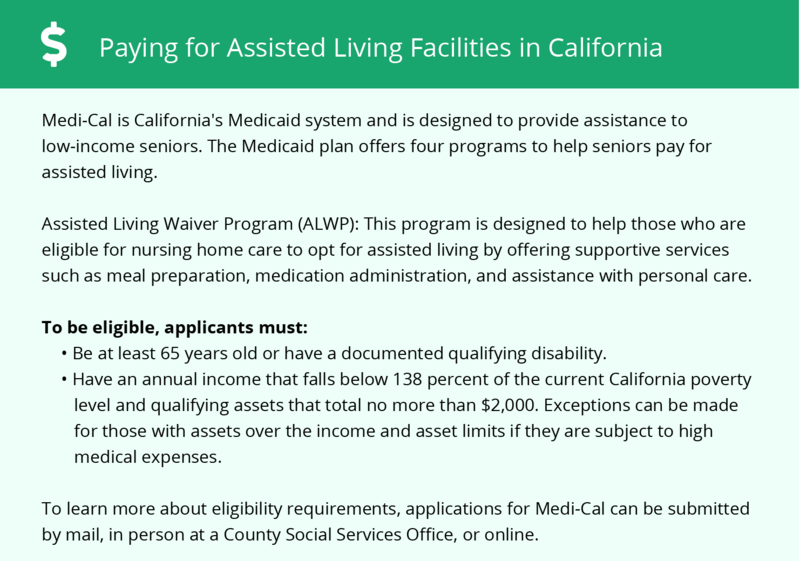 The second program is California's Optional State Supplement, which may be available to seniors who receive Supplemental Security Income (SSI). Van Nuys and the surrounding area are home to numerous government agencies and non-profit organizations offering help for seniors searching for or currently residing in an assisted living community. These organizations can also provide assistance in a number of other eldercare services such as geriatric care management, elder law advice, estate planning, finding home care and health and wellness programs. To see a list of free assisted living resources in Van Nuys, please visit our Assisted Living in California page. Van Nuys-area assisted living communities must adhere to the comprehensive set of state laws and regulations that all assisted living communities in California are required to follow. Visit our Assisted Living in California page for more information about these laws.